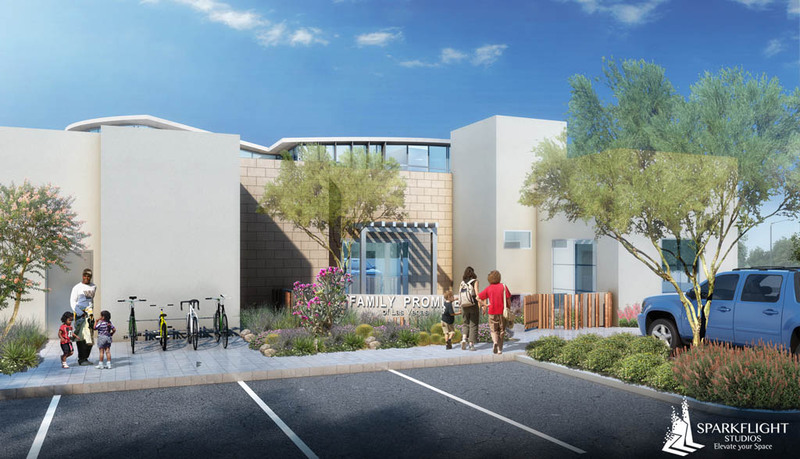 The mission of Family Promise of Las Vegas is helping homeless families transition to permanent housing and independence. This 8,745 SF Family Navigation Center is an extension of these values by providing spaces of learning, healing, and comfort. Through its progression of courtyards wrapped with light and color set in the delicate landscape of the Mojave, the new center is a place of refuge and rejuvenation. At the entry courtyard a protective canopy invites passage. Walking inside the building reveals an immense elliptical sky portal above, a symbolic embrace holding families within its light-filled arms. Here in the “Living Room”, families receive care and support from staff and other families. One also finds a kitchen that looks out onto a desert garden, making the connection between food, Earth, and people. Other amenities include: reception area, director and staff offices, computer workstations for job searching, training and resource classroom, and a children’s learning center. Healing and solitude are also important for these families. For those seeking silence and contemplation, a secluded library is near the entry that has windows for sky and earth. In the final courtyard, children are encouraged to play. Bridge apartments for resident families are arranged around this space with an area designated for gardening, cooking, and gathering.